1,500 Watt Drum Heaters are ideal for heating materials that require sensitive temperature control. Each unit heats and thermostatically controls the air tempeature around the sides of a metal pail. This eliminates many of the problems associated with heaters that come into direct contact with containers or contents. 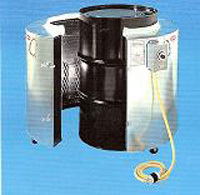 Each Drum Heater is thermostatically controlled and features galvanized steel construction, aluminum reflector plates, open coil or tubular heating elements, protective expanded metal screen, fiberwool insulation, non-asbestos gasketing and swivel caster on all Drum and Maxi Heaters for easy manueveability. Drum Heaters are adaptable to many pumps and mixers including many Dual Post Ram Heaters. Custom sizes quoted upon request. WARNING: Do not heat a closed container or use these heaters where flammable vapors are present. These units must be properly grounded for safety using the grounded plug supplied. Under no circumstances should the grounded plug be replaced with a non-grounded plug. This unit is not recommended for use in hazardous areas or any Typical Class 1, Group D Areas. See chart below for specs. Available in 60°-250°F or 100°-550°F Thermostat Range.